The Home Builders Association of the Grand Traverse Area (HBAGTA) promotes and supports residential building in our 5 county area, with a focus on education. 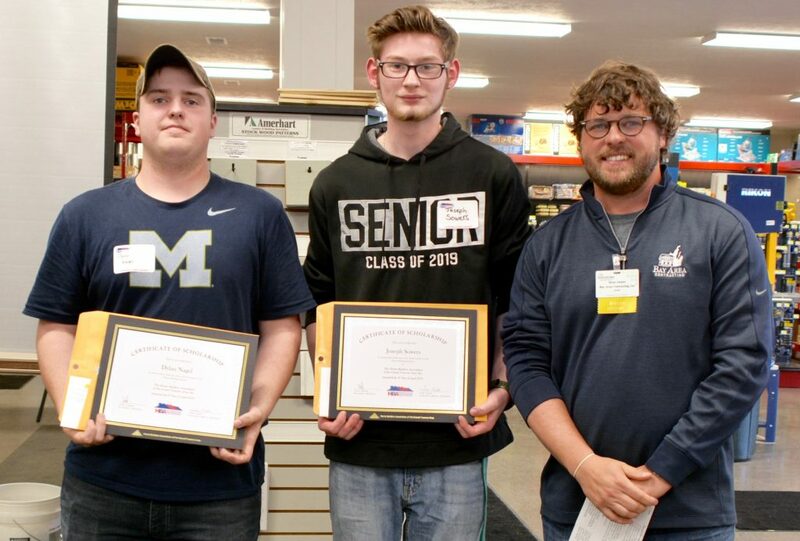 Through scholarships, the HBAGTA supports students in our area who have chosen to make skilled construction trades their career choice. They are the future of Northern Michigan and they are tomorrow's employees that employers are desperately in need of today. Scholarships are awarded on an annual basis. Since 1984, 129 scholarships have been awarded, equaling $107,798.42 to NMC and its students. The Grand Traverse Regional Community Foundation Scholarship application opens on February 8, 2019. The deadline to apply is April 1, 2019 and awarded at the HBAGTA General Membership Meeting held on April 8th. 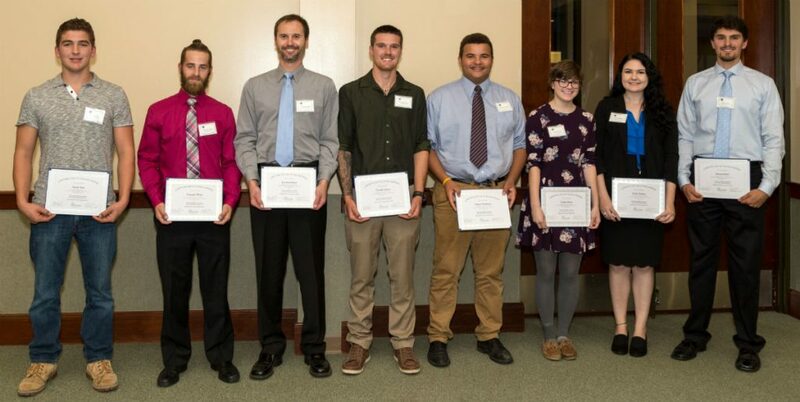 The Northwest Michigan College (NMC) Scholarships are awarded during the annual HBA Scholarship Dinner each fall. Applications will be available in May. Fall 2019 - Applications Being Accepted - NOW! Click on graduation cap to apply! NORTHWESTERN MICHIGAN COLLEGE SCHOLARSHIP - $9,000 was awarded for the 2018-2019 academic year. Multiple applicants were awarded. Scholarships are available multiple years for each applicant. Field of study MUST be related to the Home Building Industry. This includes the skilled trades and supporting industries. Must attend Northwestern Michigan College or an NMC program during 2018-2019 academic years. Must be a resident of one Antrim, Benzie, Grand Traverse, Leelanau or Kalkaska County. Demonstrated community involvement, leadership and/or service. Applicants are encouraged to submit a letter of reference/recommendation as a supplement to the application. Preferably written by an active member of the Home Builders Association of the Grand Traverse Area. Scholarship recipients will be announced at the HBA General Membership Meeting on April 8th. GRAND TRAVERSE REGIONAL COMMUNITY FOUNDATION - HBA: A minimum of $1,225 is available. Multiple applicants may be awarded. NATALIE HORNACEK: Graduating from Kingsley High School this year. Also attends the Career Tech Center and will study toward a degree in Career Technical Education at Ferris. Natalie will be going to school while going into the Air National Guard. Natalie currently works for Kingsley Lumber. NEIL CAREY: 2004 TC Central graduate. Currently employed by Voltage Electric and is an electrical apprentice in the IBEW Union working towards his electrical Journeyman's and then Master's license. EMILY PERKINS: 2016 Kalkaska High School graduate. currently attending NMC studying Carpentry & Construction Management. Became interested in the skilled trades when she attended NMC's Building Tomorrow event, a hands-on introduction to the skilled trades. GABRIEL JOHNSON: Graduating this year from Frankfort High School and will be studying Construction Management at Ferris State University. He got his first toolset and belt at the age of 4! Took shop class in the 7th & 8th grades and drafting & design as a senior. SHALE NOWLAND: 2016 TC West Graduate and currently attending NMC, studying to be an electrician. Works at Sherwin Williams and has assisted with projects at job sites. Several years as a boy scout and very goal oriented! BRENTON DRAKE: Not Pictured Graduating from Elk Rapids High School this year. Studying Mechanical Engineering at Michigan Tech. Brenton is familiar with the trades, his father is a plumbing manager with Team Bob's and his mother, Kris Drake, works at Infusion Kitchen and Bath. 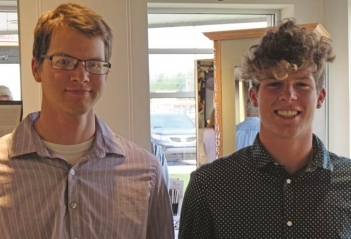 Brenton has enjoyed assisting his father with work projects. ALYSSA CULLEN: Not Pictured 2016 Grand Traverse Academy graduate. She plans to graduate from Michigan Tech with a Civil Engineering degree and attending graduate school so she can work as an architect with a sound understanding of engineering, functionality, and sustainability. CORINA HURST: Graduated from Grand Traverse Academy and a current student at NMC, with studies in Sustainable / Green Building & Architecture. SAMUEL JAVED: Graduated from TC West Senior High and is currently studying Construction Management at NMC. EMILY PERKINS: Graduated from Kalkaska High School and a current student at NMC with studies in Carpentry & Construction Management. JONATHAN REED: Graduated from TC West Senior High, and currently studying Carpentry Technology at NMC. AUSTIN SOLO: Graduated from Frankfort High School. Currently a full time electrical apprentice and attending the NMC electrical program. TIMOTHY SPIRES: Graduated from Hartford High School and currently studying Construction Management at NMC. ZAKARY WASHBURN: A current student at Bellaire High School and taking classes at the Career Tech Center for Construction Trades. Graduating next June and planning to attend NMC's Construction Management and Carpentry Technology. DOMINIC WEISS: Graduated from Fenton High School and currently studying Carpentry Technology at NMC. 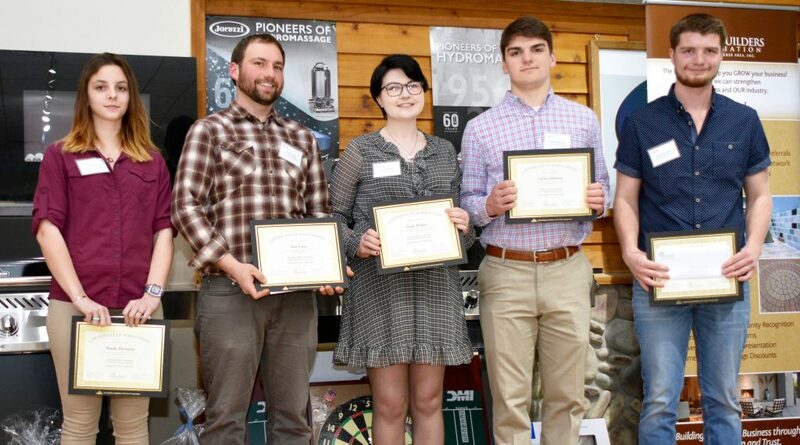 BRIDGET BERNHARD: Bridget is a 2012 Graduate from Traverse City West Senior High School and is currently studying Renewable Energy within the Electrical field at Northwestern Michigan College. Bridget is an apprentice with Consolidated Electrical Company. SAMUEL JAVED: Sam is a 2013 graduate from Traverse City West Senior High School and has recently started working in the Home Building industry with Maurer Construction. Samuel is currently enrolled in the Construction Management program at Northwestern Michigan College. TAYLOR BANTIEN: 2015 graduate of Elk Rapids High School. Taylor is currently enrolled at NMC in the Construction Carpentry Technology Program. Upon completion of her studies at NMC, Taylor is looking to work in the residential building industry. CORINA HURST: 2016 graduate of Grand Traverse Academy. Corina's goal is to earn a degree that will help in serving others, ideally in a way that involves designing and building sustainable and economical housing/shelter for those in need. Corina's mother, Marcy Hurst is an HBAGTA member. TIMOTHY SPIRES: 2014 graduate of Hartford High School. Timothy currently works for Northwest Carpentry. His goal is to earn his degree in Construction Management and eventually start his own construction business. ROBERT DANBERT: Robert graduated from Ellsworth High School in 2007 and has recently started working in the home building industry. He is attending NMC and working toward his PLC (Programmable Logic Controller) Certificate. Robert is also in the JATC electrical union apprenticeship program. MARK MACHIN: 2016 graduate from Central High School, with Structural Engineering being Mark's field of study. Mark plans to attend NMC for 2 years and then head to Michigan Tech to finish his degree. Mark's parents, Angie and Patrick are contractors and members of the HBAGTA. JACOB WILLIAMS: 2016 graduate of Benzie Central High School with Architecture being his field of study. During his junior year, Jacob was inducted into the National Honors Society. Jacob plans to attend the University of Detroit and run cross country and track will pursuing his Master's Degree in architecture. Jacob's father, Ken Williams is an architect and member of the HBAGTA.